Lionel was a basketball coach and athletics director and school administrator for several schools in Arizona, starting in 1957 as head basketball coach at Flowing Wells High School. In his first season, FWHS won its first 10 games and finished with a record of 20-4. Lionel was also the assistant football coach at Flowing Wells. He went on to coach and to be an administrator at several schools until 1972 when he took a job with the Department of Defense Dependent Schools. He was principal of Yamato High School in Tachikawa, Japan, and coordinator of all DODDS high schools and middle schools in the Pacific Region. 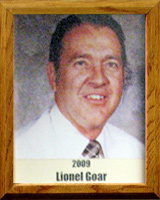 Lionel returned to Arizona in 1977 as a school administrator in 1993. Lionel attended Ajo High School and played football, basketball, and baseball, graduating in 1949. He attended Arizona State College, served in the Air Force for four years, and then played basketball at the University of Arizona. (1955-57).